Pre-heat the oven to the lowest setting. Add a platter and four dinner plates; let warm while you make the veal. Season the cutlets on both sides with salt and pepper. Place 2 sage leaves on top of each cutlet, then wrap a slice of prosciutto around each cutlet. Place the flour on a large plate. Dredge the cutlets lightly in the flour, shaking off the excess. In a large skillet, heat 2 tablespoons EVOO, two turns of the pan, over medium-high. Add half the cutlets and cook, turning once, until golden and cooked through, 2-3 minutes per side for medium doneness. Transfer to the warm platter and repeat with 2 tablespoons of the EVOO and the remaining cutlets. Add the remaining 1 tablespoon EVOO, one turn of the pan, to the skillet. Add the mushrooms and cook, stirring often, until browned, 7-8 minutes. Add the shallot and garlic; stir for 1 minute, then add the Marsala. Increase the heat to high and boil until the sauce is reduced by half, about 4 minutes. Add the stock and butter and remove from the heat. Stir until the butter melts and the sauce thickens. In another large skillet, bring a few inches water to a boil. Salt the water, add the asparagus and cook until crisp-tender, about 3 minutes; drain. Divide the cutlets among the warm plates. Top the cutlets with the Marsala mushrooms. Garnish with the chopped parsley. Serve with the asparagus. In Recipes-list.com we have selected the most viewed recipes from category - uncategorized . Enjoy the best recipes specially selected for you! 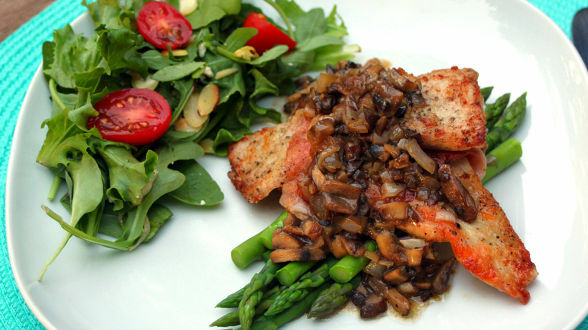 Veal Saltimbocca with Marsala Mushrooms and Asparagus is the right choice that will satisfy all your claims.